Vicky here again – with a post for the ladies! We have been non-stop this year, making the most of the glorious weather and the beautiful location right on our doorstep. Being outdoors and in the water so much has meant that we’ve needed the right gear that suits this. Here are a few reviews of stuff i’ve been using. I love the Tribord Ladies UV Rash Vest. It is really stylish and the price is amazing (£8.99), such a bargain for a superb item of beach wear. The top is quite tight fitting, which means it stays in place and is so comfy, you forget you’re even wearing it. Recently, I wore it for most of the day whilst kayaking and on the beach. It was hot yet a bit cloudy, so I was glad I had this top on as it got a bit cooler at times and the polyester material kept me so much warmer. I think I would have ended the day early had this not been the case. After having our lunch and exploring the beach, the top wasn’t wet at all as it is made from a quick drying fabric. Thankfully, the cut of the top and the panels under the arms meant that there was no chaffing like some rash vests I have worm previously. The specs of this top claim it has excellent UV protection. Looking at the tan lines on my arms, I can prove this is the case! I love the drawstring at the bottom too as I was able to tighten the top and it stayed right where it was all day! However, when I got too hot, the top was easy to take off. It packs up very small, so when I wasn’t wearing it, I stored it neatly in my bag. This rash vest is perfect to wear both on its own and also underneath a wetsuit due to its design. It definitely keeps you warmer and looks awesome too! I don’t think you can get a better rash vest for that money. I already have a pair of stylish flip flops, great for beach wear but they are pretty useless in the sea, always falling off as soon as I walk in the water. So I decided to get these fab new sandals from Keen called UNEEK. Like the name says – they really are unique. I’ve never seen a pair of shoes like it and although not as much as a cheap buy as the rash vest, they are definitely worth every penny! The colour is what drew me to them in the first place. To be honest, as they have over 20 different colour combinations I was spoilt for choice. I picked the Magnet/Capri combo as I felt it would look good with my wetsuit. 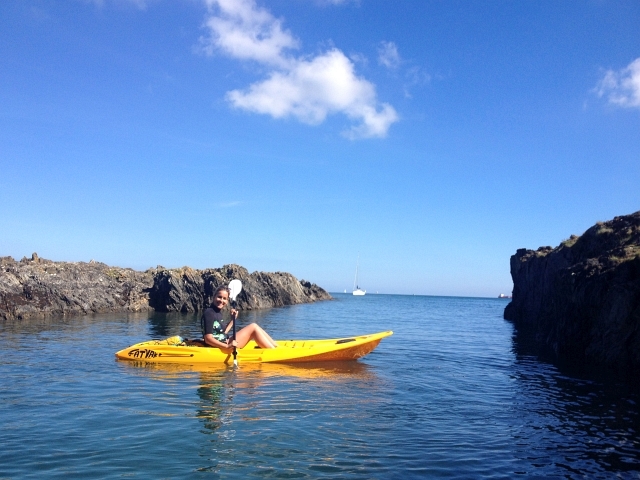 Once they arrived I thought I would try them out on our next Kayak adventure on the south coast. And they were perfect. 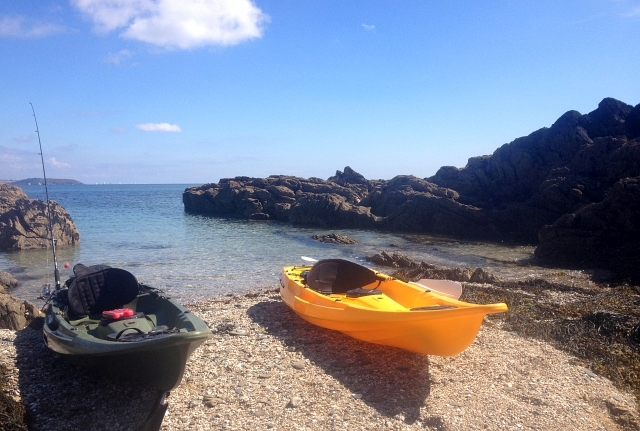 I knew that we tend to head along the coast, find a beach or cove then land the kayaks and explore- this normally involves climbing over the rocks and looking for a place to chill for lunch. Thankfully, the sandals were great both in and out of the water. The material of the sandals dried really quickly so I was able to wear them all day and they didn’t rub at all! 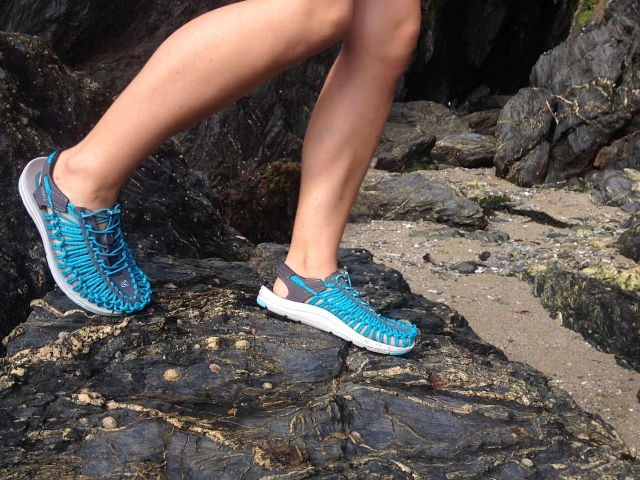 Because they have a two cord system, they basically moulded to my feet and proved very comfortable to wear, especially as they are so lightweight. 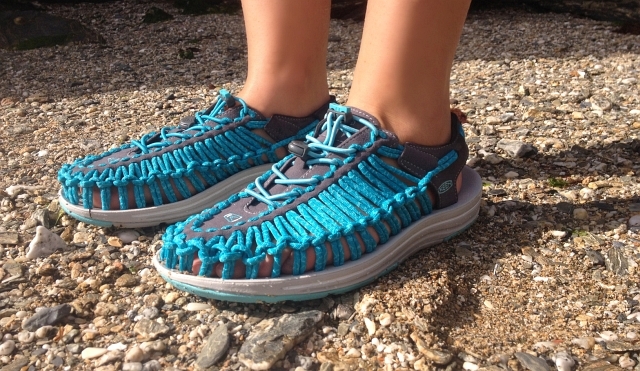 They never slipped off my feet at any point- they felt very secure with the elastic cord laces pulled to where I wanted. Due to the traction of the rubber soles they have the best grip of any sandal I’ve tried, even on wet slippery rock. The combination of beautiful Cornwall and the summer holidays, means lots and lots of people. And when we returned from our kayaking day out, the beach was absolutely heaving. Getting changed out of my swimwear could have proved slightly awkward. 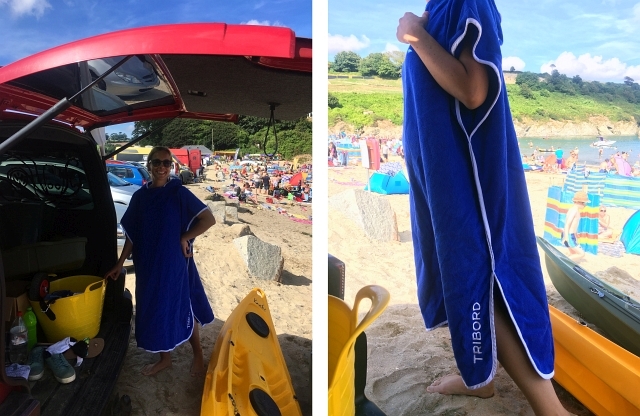 Thankfully, I brought along my new Tribord Beach Poncho Towel and it was brilliant. It is a simple design, just a towel with arm holes and a hood, however, it was perfect for changing discreetly. It is easy to put on as the arm and head holes are a good size. The poncho is made from a very absorbent material, so I was able to dry off quickly and although lightweight, it is really cosy and warm. The best part is the fact it is long enough to cover everything, right down to your knees, and I was easily able to put my arms inside to change, keeping my dignity intact. The poncho looked great and packed down nice and small. It washes and dries quickly, so it’s ready for it’s the next outing. Like you’d expect from Tribord, it’s also incredible value at only £13.99! I really recommend you get one, in my opinion – the first time it saves you from an accidental towel drop, it’s already been worth the money!